Postcard #14 – Another One From Texas…Or Is It? A NaNoWriMo participant from Houston sent me this postcard. I found it really interesting that Davy Crockett is prominently pictured here. Yes, Crockett died at the Alamo which figures enormously (and possibly ominously?) in the Texan psyche. 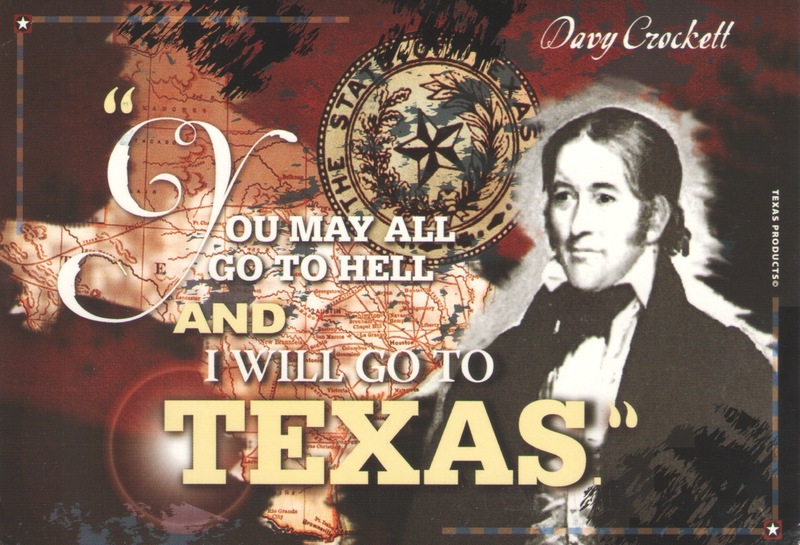 But when someone mentions Davy Crockett, the first place I associate with him is Tennessee, not Texas. That’s because I spent part of my childhood in Tennessee and when I had to study the required state history in school, that’s where I learned about him. The thing about legendary historical figures–and particularly ones who people view as heroic–is that everyone wants to claim them. I’m sure if Crockett ever spent significant time in, say Iowa, his portraiture would be on every Iowan tourist trinket ever conceived. In some ways, it transforms that person into a symbol–or to the more cynical among us, a commercial brand. Exactly who that person is or was, their thoughts, philosophies, and complexities, are reduced to so many images and random quotations among the commemorative mugs and t-shirts and, yes, even postcards. This is the first postcard I’ve featured on this blog that has a real person on it. But it won’t be the last. And frankly, I have mixed feelings about it. On one hand, the sender picked it out because this historical figure meant something to them. But I, as the receiver, become acutely aware that the postcard is nowhere near the entire picture.